What was the “Murder Castle” really like? 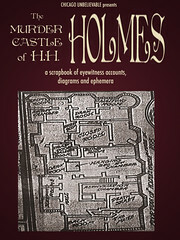 Accounts of eyewitnesses and neighbors collected from the 1890s through its destruction in the 1930s, with photos and diagrams – many reprinted here for the first time. Our first MINI ebook is now 2.99, and includes an active table of contents and internal links. Newly revised, corrected, and updated in 2012. Don’t have one of those? for your pc, mac, iPad or phone. Who’s Buried in Big Jim Colosimo’s Tomb?